2 or more: $27.43 ea. This child-sized laptop boasts a full keyboard with easy-to-read buttons for numbers and quick buttons to bring kids to various games and activities. Every time your child presses a button, the laptop will repeat the button's function, encouraging learning. A volume button offers three levels of sound, although the sounds and background music cannot be turned off. The on/off button preserves battery life, and the side port for the included mini-USB cord features a spring-closed cover. The Tote and Go Laptop's games are separated into categories based on knowledge area, including letters and words, numbers and shapes, and logic and games. Each section features several games uniquely designed to encourage your child's mind and prepare your little one for school. The report card button allows you and your child to review progress for each of the games. The laptop's games teach skills such as differentiating between capital letters and letter sounds, identifying shapes, comparing amounts, and counting, all with the help of cute animal friends. Kids can investigate the world of social networking with the Net Pals activity, which allows kids to interact with animal friends. Kids can send postcards, visit or play with animal friends, or give gifts to their buddies. Apart from the social network, your child will be able to curate his or her very own fish tank. With the Music Party feature, the laptop allows your child to select and listen to songs from a playlist. While the music is playing, your young one can interact with instrument-playing animals, press different numbers to change songs, or touch numbers on the keyboard to add in some funny sounds. Parents can connect the laptop to a PC or Mac with the included USB cord to access even more games and activities. Once you have downloaded and installed the Learning Lodge Software, you and your child will be able to watch and listen to short stories downloaded from the internet, send and receive e-cards from friends and family, and download new vocabulary words for the picture dictionary. 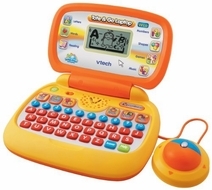 With the Learning Lodge Software, this laptop can continue to provide hours of fun as your child grows. The Tote and Go Laptop comes with a one-year limited warranty.